Many leading researchers are focused on translation and commercialisation of their research outcomes and welcome industry partnerships. From malaria to the deadly Strep A bacteria and the world’s largest critical mass in cancer glycomics, the Institute for Glycomics is the only facility of its kind in Australia and one of only a handful in the world tackling diseases of global impact at the new frontier of biomedical research – glycomics – cracking the ‘carbohydrate code’ and the crucial role carbohydrates play in diseases. Founded in 2000 by Institute Director Professor Mark von Itzstein, who featured on the cover of Time Magazine as co-inventor of the world’s first anti-flu drug Relenza, the Institute boasts more than 200 research and support staff, including Professor Michael Good AO, who has vaccines for both Malaria and Strep A bacteria in human clinical trials. The Institute provides a multidisciplinary approach to research and education, spanning medicinal and computational chemistry and various biological and physical sciences. A comprehensive portfolio of research programs focuses on some of the most significant viral pathogens (influenza, parainfluenza, dengue virus, HIV and emerging alphaviruses); bacterial infections (N. meningitidis, N. gonorrhoeae and Group A Streptococcus); parasitic diseases (including the malaria vaccine, PlasProtecT® currently in human clinical trials); and cancers. 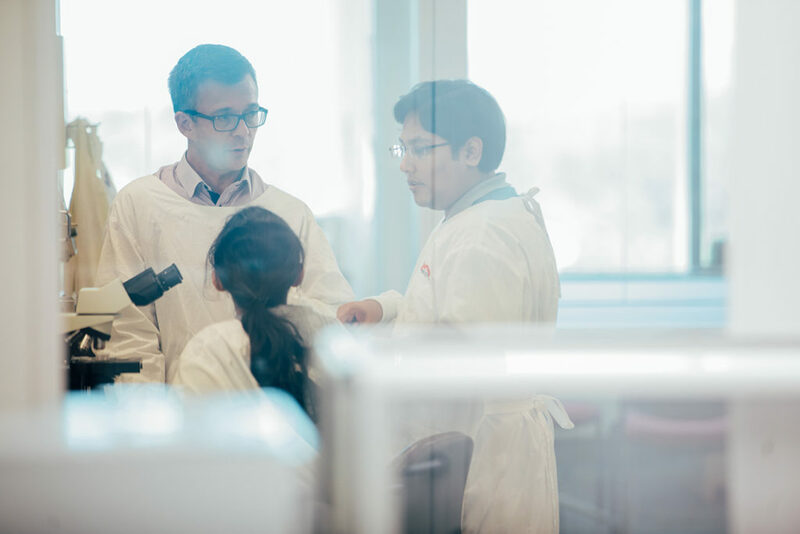 It also hosts the Australian Centre for Cancer Glycomics, a world-leading cluster of researchers. The Institute boasts a range of cutting-edge research facilities and equipment – a Glycobioanalytical facility (including glycan array and bioanalytical suite), a Flow Cytometry facility offering high-end instrumentation and expertise for cell/particle analysis and sorting; and specialised nuclear magnetic resonance and spectroscopy and protein x-ray crystallography equipment. Leading the way in preventative and integrated health, researchers at Griffith’s Menzies Health Institute Queensland, together with their clinical colleagues at Gold Coast Health, are at the forefront of helping people live and age well – investigating the genetic basis of disease, supporting healthy childhood development, tackling chronic and infectious diseases, personalising medicine and developing ground-breaking allied health innovations for exercise and nutrition and more effective and economical health and aged care. Chronic diseases are being tackled through research, clinical innovation and technology – from world-leading chronic fatigue research to ground-breaking musculoskeletal innovation that combines high-tech testing with leading-edge medical imaging to customise training, prevent sports injuries, improve rehabilitation and model orthopaedic surgery. A strong focus on allied health supports innovative interventions to create wellness, underpinned by strength in population health economics. Established in 2015, Menzies Health Institute Queensland is a globally-renowned partnership between Griffith University and the prestigious Menzies Foundation and Griffith’s largest research institute. The Institute includes the National Centre for Neuroimmunology and Emerging Diseases. Dedicated to researching and developing the next generation of intelligent products, tools and services, the IIIS aims to harness artificial intelligence technologies to create user-friendly, effective and adaptive systems, capable of responding to the needs and challenges of complex, changing and unpredictable environments. Innovative, exploratory and entrepreneurial, the IIIS develops technologies with real-life applications. The IIIS offers automated design analysis and verification for advanced manufacturing. Key research themes are: computer vision and signal processing; autonomous systems; cyber and network security; machine learning (AI/Augmented Intelligence), big data and analytics; and software engineering. Professor Jin Song Dong is the Director of the IIIS which has 40 faculty members and 80 PhD students. Prior to joining Griffith Jin Song had been in the School of Computing at the National University of Singapore (NUS) since 1998. His research is in the areas of formal methods, model checking, semantic technology, safety & security critical systems and probabilistic reasoning. He co-founded PAT reasoning system which has attracted 3000+ registered users from 900+ organizations in 72 countries, including, e.g., AutoNetworks Tech, Toyota, NTT, Mitsubishi, Japan Aerospace eXploration Agency, BD Biosciences, etc. Jin Song has been awarded large individual research funding from various defence research agencies. Part of Griffith’s Environmental Futures Institute, the Centre for Clean Environment and Energy is a leading multi-disciplinary centre focused on developing environmental and clean energy solutions, including using innovative nanotechnologies to develop new materials. The CCEE boasts broad expertise across environment and pollution chemistry, environmental microbiology, geochemistry, sensing technology, electrochemistry, biochemistry and biotechnology, photochemistry and photocatalysis, membrane science and nanotechnology. Centre Director Professor Huijun Zhao is also Deputy Director of Griffith’s Environmental Futures Institute and holds distinguished membership of the Chinese Government’s One Thousand Foreign Experts Program of “State Specially Recruited Experts”, as Director of the Centre for Environment and Energy Nanomaterials, at the Institute of Solid State Physics, Chinese Academy of Sciences (CAS) in Hefei. His research focus is the development of functional environmental and energy nano-materials. Professor Zhao oversees 60 Griffith researches and PhD students, with 4 Future Fellows, 5 full professors and one Associate Professor, and 180 staff in China, including 13 full professors. The Centre has established a sophisticated network of research collaborations nationally and internationally with Institutions and researchers in China, Hong Kong, Singapore, Japan, Korea, Europe and the USA. The CCEE facility utilises more than $5million in high tech scanning, printing and materials characterisation equipment. 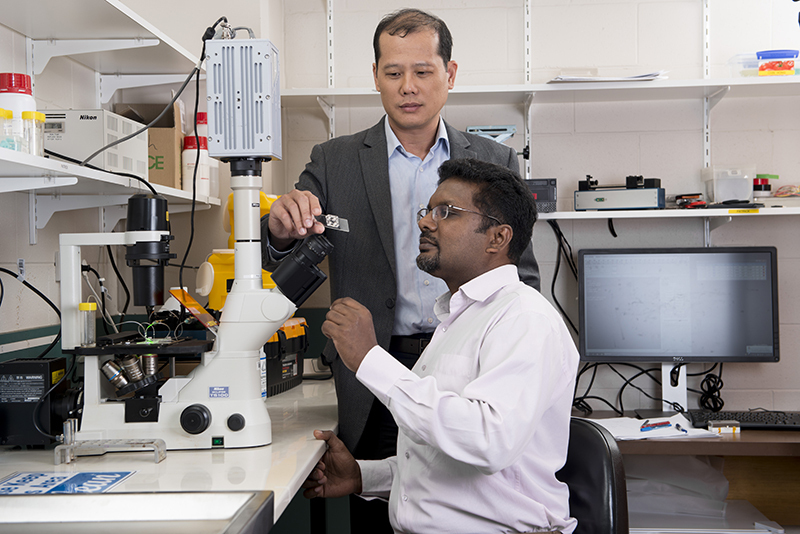 Griffith University’s Queensland Micro and Nanotechnology Centre’s world-class expertise is in materials development, silicon carbide microelectronics, micro-electromechanical systems and microfluidics to develop cutting-edge technologies. Research focuses on transport and flow in biomedical systems, microfluidics and lab-on-chip technology, point of care diagnostics, micro/nano machining technologies, silicon carbide on silicon technology, graphene technologies, and energy efficient electronics. The purpose-built Queensland Microtechnology Facility, containing class-100 and class-1000 cleanrooms, unique silicon carbide processing equipment and much more, and the Raman Spectroscopy Laboratory form a significant part of the Queensland Node of the Australian National Fabrication Facility. The Centre also hosts the National Hydrogen Materials Reference facility, a state-of-the-art reference laboratory focusing on hydrogen storage materials and hydrogen embrittlement.Centre Director Professor Nam-Trung Nguyen is a world leader in his field, with over 400 publications, with an average citation rate of 21 citations per article, and having earned more than $8 million in competitive research funding. He joined Griffith University in 2013 after 15 years in Singapore and ten years of academic study and research in Germany, and won the 2018 Vice Chancellor’s Award for research leadership. Innovating at the cutting-edge of chemistry and biology, GRIDD collaborates with governments, academia, communities and the health industry to create new knowledge that transforms lives for the better. Research focus areas include cancer, infectious diseases, Parkinsons disease, spinal cord injury repair and drug resistance. GRIDD hosts Naturebank, a unique collection of 60,000 natural product fractions ready for screening against any disease, as well as Compounds Australia, the nation’s only dedicated compound management facility, which connects chemists and biologists. The Cities Research Institute brings together expertise across a range of academic disciplines, with strong multidisciplinary research to understand and meet urban challenges. Incorporating the Griffith Centre for Coastal Management the Institute has particular expertise in coastal resilience and urban water, with other focus areas including smart cities, intelligent infrastructure and digital technologies for energy and water utilities and building science and construction innovation. The institute collaborates with governments, industry and community across Australasia and the Asia Pacific. Opened in March 2018, the state-of-the-art showcase laboratory includes a new $1.2 million medical-grade 3D printer. Also boasting a range of other high-tech equipment and advanced digital design capabilities, it's a test platform for working with a range of industries on rapid prototyping projects. The GCHKP is rapidly developing a strong clinical trial capacity, leveraging Australia’s reputation for excellence and innovation in clinical trials. From Phase I-IV, clinical trials are catered for in both hospital and university facilities for a range of drugs, vaccines and therapeutic treatments.